Bus from Johor Bahru to KLIA/KLIA2 is relatively new bus service provided by YoYo. This service provides great convenience for Johor residents as well as some Singapore residents to take direct bus from Johor Bahru to KLIA/KLIA2. In the past, they need to take bus from Johor Bahru to KL before transferring shuttle bus to KLIA or KLIA2. Duration for bus from Johor Bahru to KLIA/KLIA2 takes about 4 hours with 1 washroom break provided along the journey. The online booking bus fare for bus from Johor Bahru to KLIA or Bus from Johor Bahru to KLIA2 is SGD 33.00. Though it is higher than the bus fare for bus from Johor Bahru to KL, it does not stop people from taking the service. 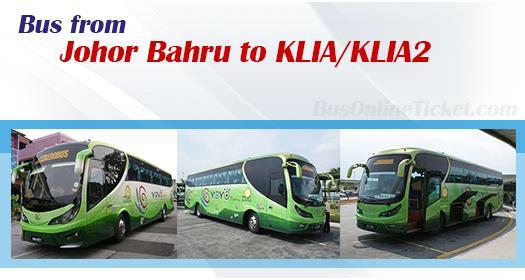 It is simply because direct bus from Johor Bahru to KLIA/KLIA2 is much more convenient. YoYo currently provides daily 8 schedules of bus service from Johor Bahru to KLIA/KLIA2. The bus from Johor Bahru to KLIA or Bus from Johor Bahru to KLIA2 departs from Tun Aminah bus terminal, Johor Bahru. Please take note that Tun Aminah bus terminal is different from Larkin bus terminal. It is about 15-20min driving distance away from Larkin bus terminal. Passengers should book the bus ticket online in advance to avoid disappointment due to limited trips per day and sole bus service provider in the market. Booking bus ticket at BusOnlineTicket.com is secure and hassle-free. As long as you have the internet access and credit card, you could make online booking at BusOnlineTicket.com anywhere under the sun. You not only can book ticket for bus from Johor Bahru to KLIA/KLIA2, but also other bus ticket within Malaysia in BusOnlineTicket.com.